Hacked Gadgets :: View topic - Check out my new project. Don't think it's seen before. Check out my new project. Don't think it's seen before. Posted: Thu Oct 19, 2006 9:13 am Post subject: Check out my new project. Don't think it's seen before. I've made a cool PIC/LED project. I think this may very well be the first of its kind. At least i came up with the idea myself. It's an interactive picture frame! Sorry for the poor picture quality. When I used the camera flash, the LED effect was unnoticable, and I diden't have the patience to set my tripod. I'm very fond of Skype. I've got myself a cordless skype phone and has my computer turned on whenever I'm avake. Actually i hardly use my regular phone. This opens up for some possibilities. Here's where the picture frame comes in. 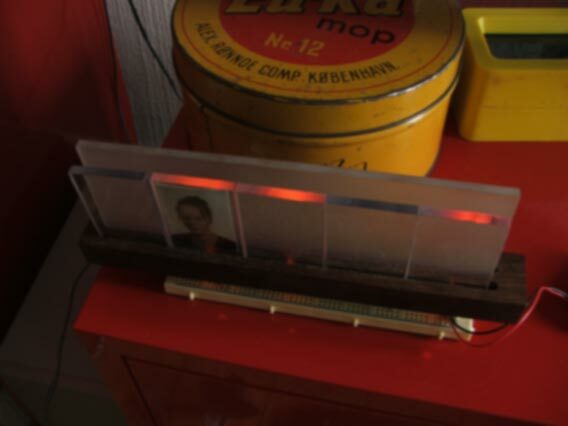 The picture frame can hold 5 passport-photo sized pictures, and each frame glass will glow whenever the person in the frame is online. The base is in a very nice hardwood. So hard that i had to use a metal milling machine to mill the grooves for the plexiglass. The rear glass is sandblasted. We hear voices and do what they command. We have broccoli in our socks. Wow this project looks and sounds very interesting. Look forward to the final project an more details. Looks nice so far. How are you connecting your computer to the PIC? 5 LED's are connected to the B0-B4 pins on my PIC16f628 processor. A max232 chip and 5 ancillary capacitors give me serial communications. Power is supplied externally using a 5V voltage regulator. If you use a better/larger PIC processor you could make the system USB powered, and draw the power to the board from the USB port of your computer. If one wanted to make a user-friendly product, this would be preferred. You could allso use a seperate USB/serial communications chip with the PIC16f628 or a similar PIC, but I just used what i had on the shelf. If you're not so familiar with PIC programming, I'd reccomend you to visit my website www.volunteerlabrat.com where i've got a tutorial that let's you build your own small dongle-style PIC programmer and tells you how to make your first PIC project, where you'll learn to blink an LED from the PIC processor. On my site you'll allso find my RS232 (serial comm.) breake-out board, which is a small board holding the MAX232 chip and the 5 caps, so that you can keep you breadboard/test setup cleaner. By studiyng this breake-out board, you'll learn how to build up your own serial communications interface to be used in your PIC projects. If you'd like further information on how to build the pictureframe, or regarding PIC programming in general, then feel free to cantact me. I've got a contact form on my website you can use.